Defects in T cell responses against pathogens and reduced diversity of TCRs have been described at both extremes of the life span. Yet, we still lack information on how Ag-specific T cell populations are maintained and/or altered from birth to old age. In this study, for the first time to our knowledge, we provide insight into Ag-specific TCR repertoire changes over the life span at the single-cell level. We have examined the TCR diversity of the primary CD8+ T cell response to the immunodominant HSV-1 epitope HSV glycoprotein B 495–502 (HSV gB498–505; SSIEFARL) (gB-8p) in neonatal, adult, and old C57BL/6 mice. The global distinctive features of the gB-8p–specific TCR repertoire were preserved in mice of different ages. 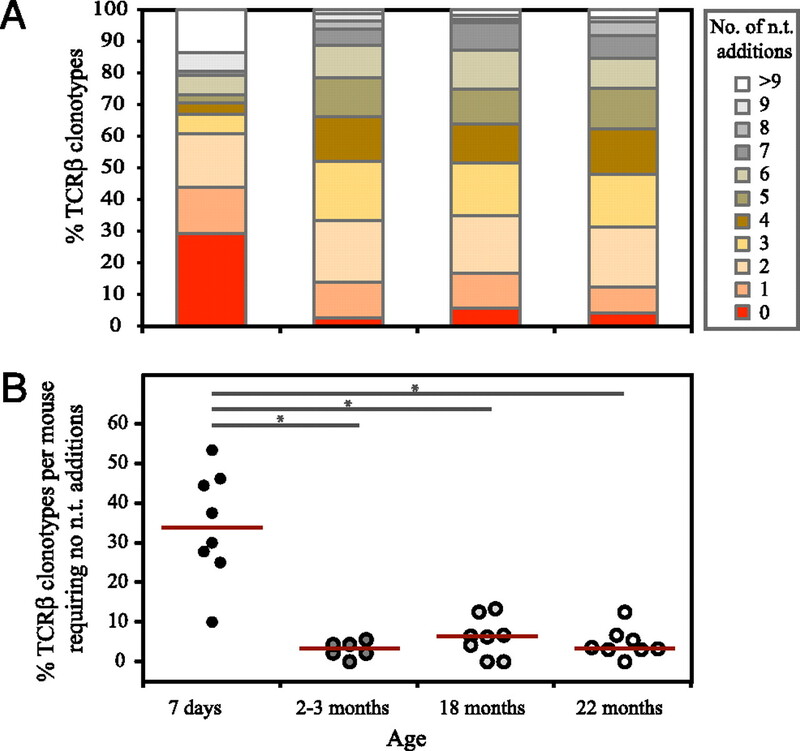 However, both old and especially neonatal mice exhibited significant decreases in TCR diversity compared with that of adult mice. Still, although the neonatal Ag-specific repertoire comprised expectedly shorter germline-biased CDR3β lengths, the repertoire was surprisingly complex, and only a minority of responding cells lacked random nucleotide additions. Changes with aging included increased use of the already dominant TCRVβ10 family, a trend for lower content of the TCR containing the germline WG motif in the CDR3, and a remarkable sharing of one dominant clonotype between individual old mice, implying operation of selective mechanisms. Implications for the rational design of vaccines for neonates and the elderly are discussed. Many infectious diseases exhibit steep susceptibility curves at the extreme ends of the life span. Although the immune system in early life and in old age is vastly different, in both cases there are reduced numbers and diversity of available T cells. This is notable because the ability of individuals to respond efficiently to new pathogens and vaccines is linked to the diversity of the naive T cell pool (1, 2). Although the overall size and complexity of the naive T cell pool is most restricted during its formation in early life and during its decline in old age, we still lack quantitative and qualitative data to understand changes in the epitope-specific repertoire across the life span. The ontogeny of T cell immunity is tightly linked to the breadth and depth of the naive T cell repertoire. Up to 90% of the diversity observed in T cells is generated by TdT, an evolutionarily conserved enzyme that adds nucleotides to the gene segments that recombine to form distinct Ag receptors (3). The expression of TdT and diversification of the TCR repertoire is developmentally regulated and is not observed in mice until ∼1 wk after birth (4, 5). After the upregulation of TdT, the less diverse perinatal repertoire is largely replaced by the more diverse adult repertoire. T cell repertoire diversity remains remarkably constant at the level of TCRVβ usage and CDR3 length diversity throughout much of adulthood due to the production of new T cells in the thymus and maintenance of existing T cells by balanced homeostatic proliferation in the periphery (6–9). However, with age, the generation of new T cells rapidly declines because of the involution of the thymus, and the naive T cell pool is continually converted to memory T cells by repeated and persistent exposure to Ags and lifelong homeostatic proliferation (10–13). The diversity of the T cell pool is further compromised by the development of age-associated CD8+ T cell clonal expansions, which can comprise >80% of the entire CD8+ T cell compartment (11, 13–15). Altogether, these changes result in a massive loss of naive T cells and overrepresentation of memory T cells that significantly restricts T cell repertoire diversity in old individuals. Defining the specific impact of aging upon TCR usage and repertoire diversity is critical for the development of cellular-based vaccines that could protect individuals across the life span. Most studies to date have only described age-associated perturbations to the T cell repertoire with broad-based techniques (limiting dilution, spectratyping, etc.) in a limited number of subjects (16–21). It therefore remains unclear how the clonal architecture of the epitope-specific T cell response is altered within and among individuals across the life span. More specifically, it is currently not known if the changes in T cell repertoire with age are entirely stochastic or whether there is a preferential selection of clonotypes with a certain CDR3 length, gene element usage, or amino acid sequence. Lastly, it is unclear whether age-associated restrictions in repertoire diversity result in more homogenous or more individualized repertoires regarding sharing of identical TCR clonotypes among individuals. Resolving these important issues requires extensive sequencing of the Ag-specific CD8+ TCRs in sufficiently large groups of individuals at various ages. In this study, we investigated the influence of age on the clonal composition of CD8+ T cells responding to a peptide derived from HSV glycoprotein B (gB) comprising aa 495–502 (SSIEFARL) (gB-8p). Mice at various ages across the life span were infected with vaccinia virus expressing the dominant gB-8p peptide, and TCR usage and repertoire diversity were evaluated. To our knowledge, our data provide the first insight into the Ag-specific repertoire in neonatal mice and into the evolution of that repertoire in adults and its narrowing to feature a highly shared clonotype with advancing age. Collectively, these findings have important implications for the development of vaccines designed to protect individuals across the entire life span. Old (18 and 22 mo) C57BL/6 (B6, H-2b) mice were obtained from the National Institute of Aging breeding colony (Harlan). Pregnant (E14) and adult (2–3 mo) B6 mice were purchased from the National Cancer Institute (Frederick, MD). Pregnant mice were individually housed and monitored daily for births. Only male mice were used for experiments, and all mice were maintained under pathogen-free conditions in the animal facility at the University of Arizona. All experiments were conducted by guidelines set by the University of Arizona Institutional Animal Care and Use Committee. Recombinant vaccina virus expressing the MHC class I-restricted CTL epitope HSV gB498–505 (SSIEFARL; denoted gB-8p in this text), designated VACV-gB, was generously provided by Dr. S. S. Tevethia (Pennsylvania State University of College Medicine). VACV-gB viral stocks were propagated and quantified in 143B cells. The gB-8p:Kb tetramer was obtained from the National Institutes of Health Tetramer Core Facility (Emory University, Atlanta, GA). mAbs anti-CD8α (clone 53-6.7), anti-CD4 (RM4-5), anti-CD11a (2D7), anti-Vβ10 (B21.5), and anti-Vβ8 (F23.1) were purchased from commercial sources. Flow cytofluorometric data were acquired on the custom FACS LSRII instrument equipped with four lasers and using the DiVa software (BD Biosciences, Mountain View, CA). Analysis was performed using the FlowJo software (Tree Star, Ashland, OR). Splenocytes were harvested at or near the peak of the primary response, and CD8+ T cells were isolated using positive immunomagnetic selection of CD8+ T cells (Miltenyi Biotec, Auburn, CA). Highly enriched CD8+ T cells were stained with biotinylated gB-8p:Kb tetramers conjugated to streptavidin allophycocyanin, anti-CD8α–PE Texas red, anti-CD4–FITC, and anti-Vβ10–PE for 60 min and washed twice. Cells were resuspended in sorting buffer and CD8+CD4−gB-8p:Kb+ Vβ10+ lymphocytes isolated as single cells using the FACSAria cell sorter (BD Biosciences). Control wells without sorted cells were included on every plate to control for contamination. cDNA synthesis, PCR amplification, and sequencing of individual Vβ10 transcripts were performed exactly as previously described (22). The gB-8p–specific CD8+ TCRβ clonotypes were characterized by sequentially aligning each TCRβ sequence with the Vβ10 (TRBV4 in the International ImMunoGeneTics nomenclature) gene and then the best-match Jβ gene, using the International ImMunoGeneTics nomenclature reference alleles for the Mus musculus TRB genes (23). The CDR3β sequence was then identified between, and inclusive of, the conserved cysteine in the Vβ-region and the conserved phenylalanine in the Jβ-region. The minimum number of nucleotide additions required to produce a CDR3β sequence was determined by first aligning the Vβ gene at the 5′ end of the CDR3β sequence and then the Jβ gene at the 3′ end of the CDR3β sequence. The Dβ genes were subsequently aligned to the nucleotides in the junction between the identified Vβ- and Jβ-gene-encoded regions, with no less than two nucleotides attributed to a Dβ gene segment. Nucleotides in the junctions between the identified Vβ, Dβ, and Jβ gene segments were considered to be nucleotide additions. The diversities of the CD8+ TCRβ repertoires specific for the gB-8p epitope in each mouse were evaluated using two different measures of diversity: the number of different TCRβ amino acid sequence clonotypes and Simpson’s diversity index (24). The similarities of the gB-specific CD8+ TCRβ repertoires between mice were assessed using the Morisita–Horn similarity index (25). The Simpson’s diversity and Morisita–Horn similarity indices account for both the variety of amino acid sequence clonotypes and their clone sizes. These relative diversity and similarity indices range in value from 0 (minimal diversity/similarity) to 1 (maximal diversity/similarity). To account for the differences in the TCRβ repertoire sample sizes obtained between mice, the diversity of a TCRβ repertoire, or the similarity between the TCRβ repertoires of two mice, were estimated as the median value of 10,000 random draws of subsamples of 40 TCRβ sequences from the total TCRβ repertoires obtained for each mouse (24, 25). The diversity and similarity analyses were performed using MATLAB (The Mathworks, Natick, MA). The features of the gB-8p–specific CD8+ TCRβ repertoires were compared across all four age groups of mice using two statistical approaches. First, a Kruskal–Wallis test (i.e., non-parametric ANOVA) was used to determine whether there were significant differences across the groups of mice of different ages. Second, to assess the differences between each pair of age groups, a Mann–Whitney U test was used, with Bonferroni correction for multiple pairwise comparisons (i.e., each pairwise test was assessed at the significance level of α = 0.05/6 = 0.0083). All statistical analyses were performed using GraphPad Prism software (GraphPad Software, San Diego, CA). More than 90% of the CD8+ T cell response in HSV-1–infected B6 mice is directed against a single Kb-restricted immunodominant epitope in the glycoprotein B (gB498–505). 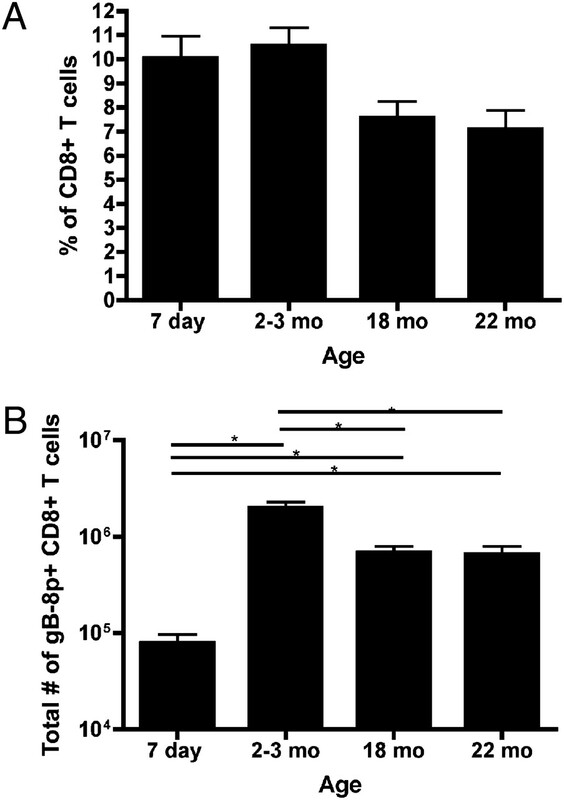 To determine how the gB-8p+ CD8+ T cell responses evolve across the life span, we first assessed the magnitude of the gB-8p–specific CD8+ T cell response in neonatal (7 d), adult (2–3 mo), old (18 mo), and very old (22 mo) mice infected (i.p.) with a recombinant vaccinia virus (VACV-gB) expressing the immunodominant gB peptide (SSIEFARL) as a nonlethal infectious challenge. Because neonatal mice have 1–2 logs fewer T cells in the spleen compared with that of adult mice, the dose of VACV-gB was titrated down to the least amount of virus (2 × 101 PFU/mouse) that was required to elicit a relative frequency of gB-8p CD8+ T cells that was comparable with that of adult mice infected with 2 × 105 PFU/mouse (Fig. 1A). The adult dose of VACV-gB was also used in 18- and 22-mo-old mice. The magnitude of gB-8p–specific CD8+ T cell responses in VACV-gB–infected mice varies with age. A, Mice of different ages were infected with VACV-gB, and the peak magnitude responses in the spleen were compared. Shown are the absolute and relative numbers of gB-8p–specific CD8+ T cells at 6 d postinfection (for 2–3 mo, 18 mo, 22 mo) and 8 d postinfection (for 7 d). Significant differences in both the percentages of gB-8p–specific CD8+ T cells and the total numbers of gB-8p–specific CD8+ T cells were observed across the four age groups: p = 0.013 and p < 0.0001, respectively (Kruskal–Wallis). B, For the total numbers of gB-8p–specific CD8+ T cells, there were significant pairwise differences between the 7-d-old and all other age groups and between the 2- to 3-mo-old and all other age groups. Results are shown as mean ± SEM, with n > 6 mice/group. A Mann–Whitney U test was used for each pairwise comparison: *p < 0.0083 (statistical significance for each pairwise comparison using Bonferroni correction for multiple pairwise comparisons). At the relative peak of the CD8+ T cell response, the frequency and total number of gB-8p–specific CD8+ T cells were quantified in the spleen with gB-8p–specific tetramers. 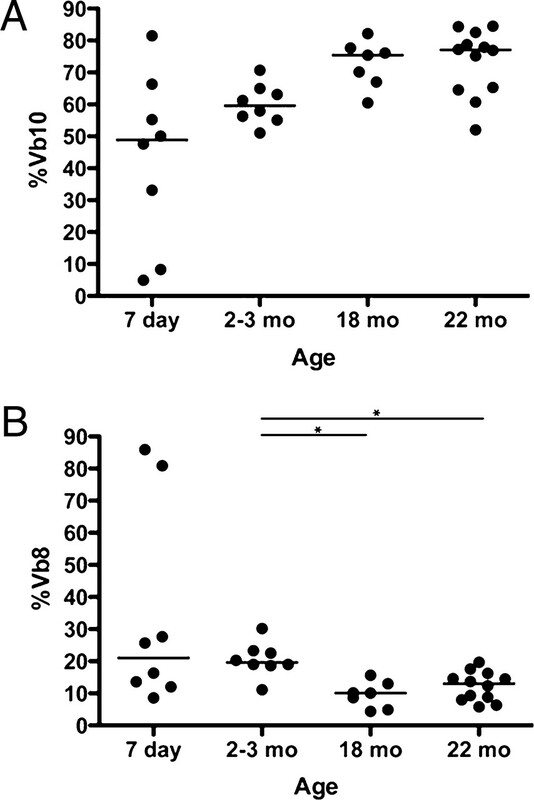 The most striking differences were observed in neonates, which exhibited a significant reduction in the absolute number of gB-8p+ CD8+ T cells compared with that of adults (Fig. 1B), at least partly due to the much reduced cellularity in the neonate T cell compartment. Absolute responses in the old mouse groups were also significantly reduced compared with those of adults. However, differences in the frequency of gB-8p+ CD8+ T cells among groups of mice of different ages were less dramatic (Fig. 1A). Another likely explanation for the diminished Ag-specific responses observed in neonatal and older mice may lie in age-related restrictions in the CD8+ TCR repertoire. To address this possibility, we first analyzed Vβ gene usage within gB-8p–specific CD8+ T cell responses from mice infected with VACV-gB. Previous studies have demonstrated that gB-8p CD8+ T cells obtained from adult mice have significant biases for T cells expressing either Vβ10 (50–60%) or Vβ8 (15–25%) TCR elements (26, 27). To examine if TCR Vβ element usage is conserved across the life span, we determined the percentages of Vβ10 and Vβ8 clonotypes within gB-8p–specific CD8+ T cell populations in individual mice from different age groups. Pronounced Vβ10 bias remained largely intact across different age groups. However, Vβ10 usage grew even more prominent in older mice (Fig. 2A), comprising more than 70% of gB-8p–specific CD8+ T cells in many of the mice aged 18 mo or older. This increase in Vβ10 usage was accompanied by a decrease in Vβ8 usage to ∼10% in older mice (Fig. 2B), revealing a potential narrowing of the TCR repertoire with age. By contrast, significant individual TCRVβ variability usage was observed in neonatal mice: whereas every adult and old mouse exhibited the preferred Vβ10 bias, other Vβ elements often dominated the gB-8p response in neonatal mice. Thus, alterations to the TCR repertoire were already apparent at this superficial level of analysis in mice at both ends of the life span. Vβ gene usage is altered in the gB-8p–specific CD8+ T cell responses elicited in mice of different ages. Dominant Vβ10 (A) and subdominant Vβ8 (B) usage in gB-8p–specific CD8+ T cell responses were compared between mice of different ages at the respective peaks of the response (as described in Fig. 1). Significant differences in the percentages of Vβ10 and Vβ8 gB-8p–specific CD8+ T cells were found across age groups: p = 0.0028 and p = 0.0031, respectively (Kruskal–Wallis). In particular, the percentage of Vβ8 gene usage by gB-8p–specific CD8+ T cells was significantly different between 2- to 3-mo mice and both 18-mo and 22-mo mice (B). Results are representative of at least two separate experiments. A Mann–Whitney U test was used for each pairwise comparison: *p < 0.0083 (statistical significance for each pairwise comparison using Bonferroni correction for multiple pairwise comparisons). Apart from a couple of neonatal mice, the Vβ10 gene was the dominant Vβ gene used by gB-8p–specific CD8+ T cells in the majority of mice, regardless of age. We therefore analyzed this part of the Ag-specific repertoire in depth by sequencing gB-8p–specific TCRs using the Vβ10 gene from 7-d-, 18-mo-, and 22-mo-old mice and compared them with repertoires from adult mice infected with VACV-gB from our prior study (22). The gB-8p–specific Vβ10+ TCRβ repertoire data used for this comparison are summarized in Table I, and an example of a gB-8p–specific Vβ10+ TCRβ repertoire from a representative mouse/age group is given in Supplemental Table I. In our previous study (22), we found that the CD8+ gB-8p–specific Vβ10+ TCRβ repertoires from 2- to 3-mo-old mice exhibited distinctive features that include a prevalent CDR3β length of 14 aa (evaluated inclusive of the conserved cysteine in the Vβ-region and the conserved phenylalanine in the Jβ-region), Jβ gene usage heavily biased toward the Jβ2 family of genes, and a prevalent, previously described (26) CDR3β amino acid motif featuring a tryptophan–glycine (WG) doublet in CDR3β positions 6 and 7 [which correspond with CDR3 positions 3 and 4 using the Chothia definition (28)]. We compared between age groups the CDR3β lengths and Jβ gene usage of the gB-8p–specific Vβ10+ TCRβ clonotypes pooled across all VACV-gB–infected mice per age group. The most striking difference between age groups was the increased involvement of shorter CDR3β sequences in neonate mice compared with that in adult mice. The gB-8p–specific Vβ10+ TCRβ clonotypes pooled across neonate mice were found to have a shift toward greater usage of shorter CDR3β lengths of 13 aa (Fig. 3A). Similar to young adult mice, CDR3β sequences of 14 aa in length dominated the gB-8p–specific Vβ10+ TCRβ repertoires in older mice (Fig. 3A). In all the VACV-gB–infected mice, regardless of age, there was a strong bias toward the use of the Jβ2 group of genes in the gB-8p–specific Vβ10+ TCRβ repertoires (Fig. 3B). Comparison of the gB-8p–specific Vβ10+ TCRβ repertoire composition for CD8+ T cell responses to VACV-gB infection in mice of different ages. A and B, Shown are the percentages of unique TCRβ clonotypes pooled across all mice per age group that have a particular CDR3β length (evaluated inclusive of the conserved cysteine in the Vβ-region and the conserved phenylalanine in the Jβ-region) (A) and Jβ gene usage (B). C, The percentages of unique TCRβ clonotypes per mouse featuring the tryptophan–glycine (WG) doublet in CDR3β positions 6 and 7 [which correspond with CDR3 positions 3 and 4 using the Chothia definition (28)], with the median values per age group represented by the horizontal line. No significant differences in the prevalence of the WG doublet were found between the different age groups (Kruskal–Wallis). The above analysis of the gB-8p–specific Vβ10+ TCRβ clonotypes pooled across all mice per age group provides an overall view of age-related differences but not about intermouse variations. The pooled clonotypes may not accurately reflect the features of the TCRβ repertoires of individual mice, which are determined not only by the TCRβ clonotypes but also by their clonal dominance. Thus, we also assessed the CDR3β lengths and Jβ gene usage of the gB-8p–specific Vβ10+ TCRβ repertoires of individual mice. Although CDR3β lengths of 13 aa were still found to be more prevalent in the gB-8p–specific Vβ10+ TCRβ repertoires of individual neonate mice compared with that in adult mice, greater intermouse variation in the CDR3β lengths was observed in 7-d-old (and also in 18- and 22-mo-old) age groups compared with that in mice aged 2–3 mo (Supplemental Fig. 1A). This is because the adult repertoire was stably distributed between 14 aa (57–83% of TCRβ clonotypes), 13 aa (<24%), and 15 aa (<24%) length, whereas in neonates and old mice, any dominant CDR3 length would skew the distribution more easily and drastically. Similarly, we observed different patterns of intermouse variation of Jβ gene usage within the 7-d-, 18-mo-, and 22-mo-old age groups compared with the 2- to 3-mo-old mice. Whereas in young adult mice no one gene from the Jβ2 family was found to be particularly dominant in the gB-8p–specific Vβ10+ TCRβ repertoires, individual Jβ2 genes substantially dominated the TCRβ repertoires in some neonate and aged mice (Supplemental Fig. 1B). For example, the Jβ2.1 and Jβ2.5 genes were prevalently used in the TCRβ repertoires of several 7-d-old mice, whereas in the 18- and 22-mo-old age groups, the TCRβ repertoires of several mice were dominated by usage of the Jβ2.4 and Jβ2.7 genes. We next assessed whether the CDR3β amino acid motif (a WG doublet in CDR3β positions 6 and 7 that is prevalent in the gB-8p–specific Vβ10+ TCRβ repertoires of young adult mice) also emerged in neonate and older adult mice. This distinct CDR3β amino acid motif was observed to also be prevalent in the mice aged 7 d, 18 mo, and 22 mo (see example TCRβ repertoires in Supplemental Table I), and there were no significant differences between the age groups in the percentage of gB-8p–specific Vβ10+ TCRβ clonotypes/mouse that featured this motif (Fig. 3C). However, there was a trend for the proportion of the TCRβ clonotypes per mouse featuring the WG doublet to decrease with age (Fig. 3C). Overall, whereas the gB-8p–specific Vβ10+ TCRβ repertoires maintained similar distinctive features in mice of different ages, a greater proportion of the gB-8p–specific Vβ10+ TCRβ clonotypes had shorter CDR3β lengths in 7-d-old mice. Moreover, we observed deviations from consensus features of the gB-8p–specific Vβ10+ TCRβ repertoires between mice at the younger and older extremes of the age spectrum on one side and the adult mice on the other side. The shorter CDR3β lengths observed in neonatal mice compared with that in adult mice could be due to a lack of TdT-mediated nucleotide additions. Thus, we assessed the V(D)J recombination mechanisms involved in producing the gB-8p–specific TCRβ clonotypes to determine whether there were substantial differences between the age groups in the extent to which nucleotide addition contributed to production of the gB-8p–specific Vβ10+ TCRβ clonotypes. Whether we calculated the proportion of germline-encoded clonotypes across the pooled samples (Fig. 4A) or the median percentages found in individual mice (Fig. 4B, Supplemental Fig. 1C), there was significantly greater representation of gB-8p–specific Vβ10+ TCRβ clonotypes requiring no nucleotide additions in the 7-d-old mice compared with that in the 2- to 3-mo-, 18-mo-, and 22-mo-old mice. The fully germline-gene-encoded gB-8p–specific Vβ10+ TCRβ clonotypes were also clonally dominant in many 7-d-old mice (Supplemental Fig. 1C). 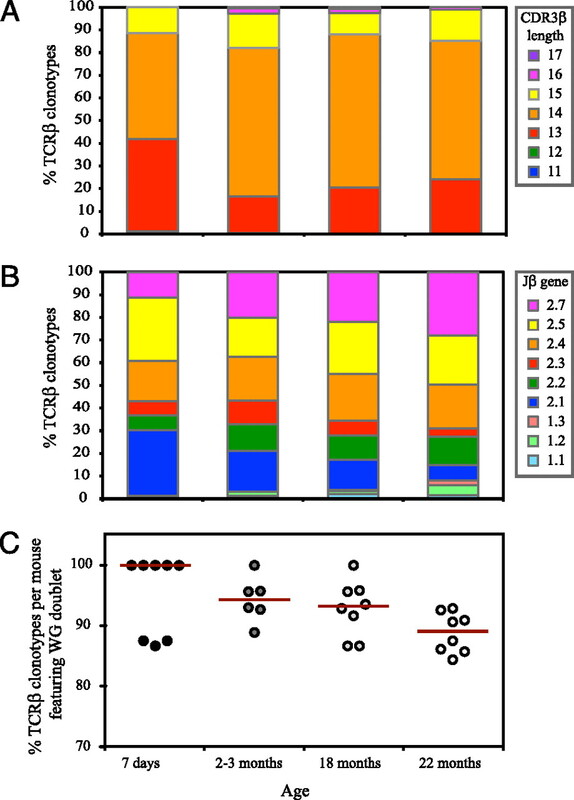 Comparison of the extent of TCRβ gene encoding of the gB-8p–specific Vβ10+ TCRβ repertoires involved in the CD8+ T cell responses to VACV-gB infection in mice of different ages. Shown are the percentages of unique TCRβ clonotypes pooled across all mice per age group that require a particular minimal number of nucleotide (n.t.) additions (A) and the percentage of unique TCRβ clonotypes per mouse requiring no nucleotide additions (B), with the median values per age group represented by the horizontal line. Significant differences in the percentages of unique TCRβ clonotypes per mouse requiring no nucleotide additions were found across age groups (B: p = 0.0007, Kruskal–Wallis). In particular, the percentage of unique TCRβ clonotypes per mouse requiring no nucleotide additions differed significantly between 7-d-old mice and mice aged 2–3 mo, 18 mo, and 22 mo. A Mann–Whitney U test was used for each pairwise comparison: *p < 0.0083 (statistical significance for each pairwise comparison using Bonferroni correction for multiple pairwise comparisons). To investigate the influence of age on the diversity of the Vβ10+ TCRβ repertoires involved in the CD8+ T cell responses to the gB-8p epitope, we first focused on the number of different TCRβ clonotypes per mouse. Using the gB-8p-specific Vβ10+ TCRβ repertoire data, the number of different gB-8p–specific TCRβ clonotypes was estimated for each mouse for a standard sample size of 40 TCRβ sequences (24). We found significant differences in the median numbers of gB-8p–specific Vβ10+ TCRβ clonotypes across the age groups, and the number of gB-8p–specific Vβ10+ TCRβ clonotypes was significantly higher in 2- to 3-mo-old mice than that in mice aged 7 d, 18 mo, and 22 mo. The number of gB-8p–specific Vβ10+ TCRβ clonotypes was also significantly lower in 7-d-old mice compared with that in 18- and 22-mo-old mice (Fig. 5A, Supplemental Table I). Comparison of the diversities of, and similarity between, the gB-8p–specific Vβ10+ TCRβ repertoires involved in the CD8+ T cell responses to VACV-gB infection in mice of different ages. Shown are the diversities of the TCRβ repertoires for individual mice evaluated using the number of different TCRβ clonotypes (A) and Simpson’s diversity index (B) and the similarity of the TCRβ repertoires between the mice within each age group (C). The Simpson’s diversity and Morisita–Horn similarity indices account for both the variety of different TCRβ clonotypes and the number of copies of each clonotype (i.e., the clonal dominance hierarchy) and vary between 0 (minimum diversity/similarity) and 1 (maximum diversity/similarity). 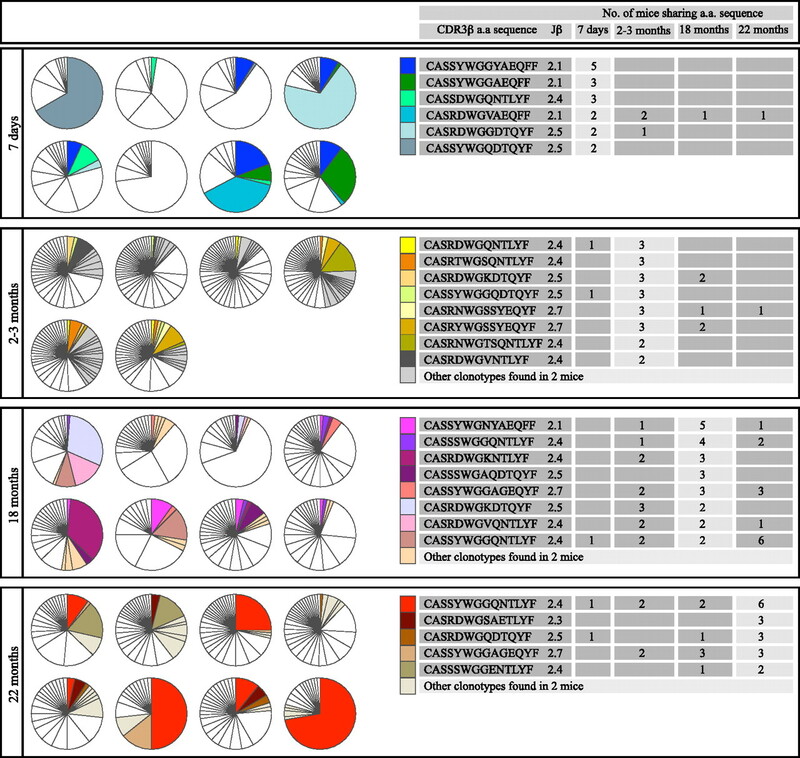 The TCRβ diversities and similarities were estimated for all samples having equal sample sizes of 40 TCRβ sequences. There were significant differences in the number of TCRβ clonotypes, Simpson’s diversity index, and the Morisita–Horn similarity index across age groups: p < 0.0001, p = 0.0004, and p = 0.0006, respectively (Kruskal–Wallis). In particular, the number of TCRβ clonotypes differed significantly between the 7-d-old and all other age groups and between the 2–3 mo and all other age groups (A). The Simpson’s diversity index differed significantly between 7-d-old and 2- to 3-mo-old mice, between 2- to 3-mo-old and 18-mo-old mice, and between 2- to 3-mo-old and 22-mo-old mice (B). The Morisita–Horn similarity index differed significantly between 22-mo-old mice and both 7-d-old and 18-mo-old mice (C). A Mann–Whitney U test was used for each pairwise comparison: *p < 0.0083 (statistical significance for each pairwise comparison using Bonferroni correction for multiple pairwise comparisons). Although the number of different TCRβ clonotypes per mouse provides a useful measure of clonotypic diversity, it does not account for the clonal dominance hierarchy among the clonotypes, which is an important aspect of the epitope-specific T cell response. Thus, we also evaluated the diversity of the gB-8p–specific Vβ10+ TCRβ repertoires using Simpson’s diversity index, which accounts for both the variety of different TCRβ clonotypes and their clonal dominance hierarchy (24). As with the number of TCRβ clonotypes, this diversity measure was estimated for each mouse for a standard sample size of 40 TCRβ sequences (24). Simpson’s diversity index was found to differ significantly across the age groups, with the Simpson’s diversity index for the mice aged 2 to 3 mo being significantly higher than that for the mice aged 7 d, 18 mo, or 22 mo. Whereas the gB-8p–specific Vβ10+ TCRβ repertoires, regardless of mouse age, mostly consisted of one or two dominant clonotypes, the extent of this clonal dominance was more pronounced (i.e., the clone size distribution of clonotypes was less even) in some of the 7-d-old and 18- and 22-mo-old mice compared with that in the 2- to 3-mo-old mice (Fig. 6). For example, in some neonatal and aged mice, the dominant TCRβ clonotype comprised more than 50% of the gB-8p–specific Vβ10+ TCRβ repertoire. The clonal dominance hierarchy and intermouse sharing of gB-8p–specific Vβ10+ TCRβ clonotypes involved in the CD8+ T cell responses to VACV-gB infection. Shown are the proportions of the gB-8p–specific Vβ10+ TCRβ repertoires per mouse attributed to individual TCRβ clonotypes and the sharing of TCRβ clonotypes between mice within each age group. TCRβ clonotypes shared between at least three mice within an age group and TCRβ clonotypes shared between two mice per age group and that were dominant in at least one of these mice are specifically highlighted. 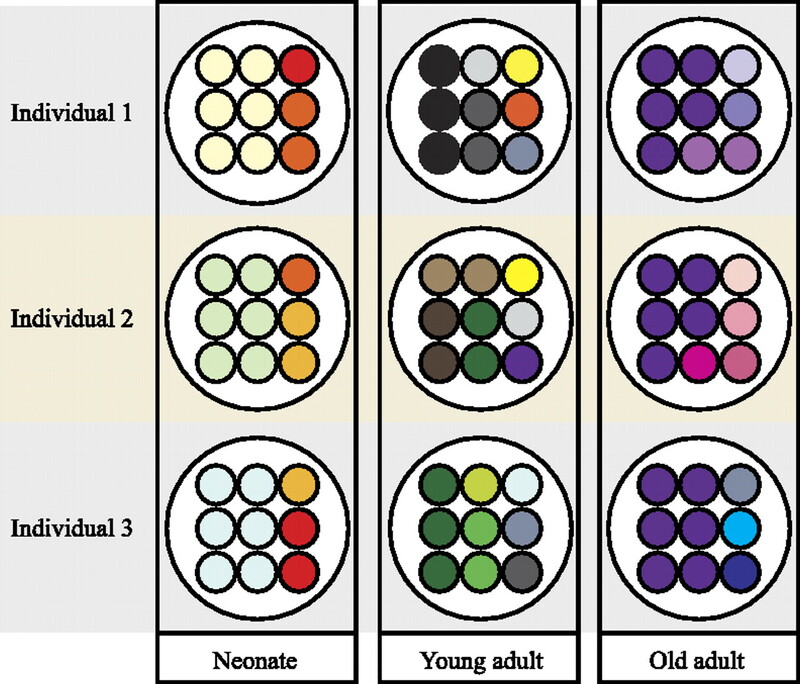 Other TCRβ clonotypes found in more than one mouse per age group are collectively highlighted. The TCRβ clonotypes listed for each age group that were also present in mice in a different age group are indicated in the tables. It should be noted that this does not represent all the sharing of TCRβ clonotypes between mice of different ages, as some TCRβ clonotypes shared between two mice within an age group were also found in either one or two mice in another age group, and some TCRβ clonotypes were only shared between two mice in different age groups. To compare quantitatively the level of sharing of gB-8p–specific Vβ10+ TCRβ clonotypes between mice within the age groups, we used the Morisita–Horn similarity index (25) to evaluate the overlap of TCRβ repertoires between all pairs of mice per age group. The Morisita–Horn similarity index assesses whether identical TCRβ clonotypes are present, and of similar clonal dominance, in the two TCRβ repertoires being compared. As above, the similarity measures between each pair of mice were estimated for a standard sample size of 40 TCRβ sequences per mouse (25). The Morisita–Horn similarity measures between most pairs of mice within each age group were relatively low (i.e., <0.4 for all but 3 pairs of 22-mo-old mice). However, the median overlap of the gB-8p–specific Vβ10+ TCRβ repertoires between pairs of mice was found to differ significantly across the age groups (Fig. 5C). Surprisingly, the similarity of the gB-8p–specific Vβ10+ TCRβ repertoires between pairs of 22-mo-old mice was found to be significantly higher than that between pairs of 7-d-old mice [as would be expected from the outcome of studies in TdT-deficient mice (29)] and than that between pairs of 18-mo-old mice (Fig. 5C). To understand better this remarkable similarity between Ag-specific TCRβ repertoires of individual 22-mo-old mice, we examined the shared TCRβ clonotypes in more detail. We found a highly shared TCRβ clonotype (CASSYWGGQNTLYF using the Jβ2.4 gene) in six of the eight mice aged 22 mo (Fig. 6). This highly shared TCRβ clonotype was one of the two most dominant TCRβ clonotypes in four of the six mice in which it was present and was also found in five other mice. However, this TCRβ clonotype was lower in the clonal dominance hierarchy in the younger mice, and the extent of sharing this TCRβ clonotype within each of the younger age groups was much lower than that for the 22-mo-old mice, as it was only present in two mice from each of the 2- to 3-mo and 18-mo age groups and in one 7-d-old mouse. Other TCRβ clonotypes were shared between many mice in the other age groups, with five neonatal mice and five mice aged 18 mo each sharing a clonotype. However, of these shared TCRβ clonotypes, we never found the same clonotype to dominate the gB-8p–specific Vβ10+ TCRβ repertoires across different individual mice. For example, relatively large portions of the gB-8p–specific Vβ10+ TCRβ repertoires in some neonate mice could be attributed to shared TCRβ clonotypes, but a different shared TCRβ clonotype dominated the TCRβ repertoire in each neonate mouse. Fig. 7 summarizes the above alterations to the gB-8p CD8+ TCRβ repertoire across the life span. Schematic representation of the alterations to the gB-8p CD8+ TCRβ repertoire across the life span. Each circle represents a TCRβ sequence. The gB-8p CD8+ TCRβ repertoire early in life is restricted due to the predominance of distinct germline-encoded clonotypes. After early development, TCRβ diversity peaks in young adults and is composed of more evenly distributed clonotypes exhibiting N-additions. With advancing age, TCRβ diversity contracts again, and there is the emergence of a dominant clonotype that is substantially more shared among older individuals. Note: some alterations to the repertoire are exaggerated to illustrate the different types of TCR diversity that are observed across the life span. TCR repertoire diversity is believed to be a key determinant of immune protection, as epitope-specific CD8+ T cells exhibiting greater clonotypic diversity are more likely to be enriched for high-avidity CD8+ T cells (30), provide heterologous immune protection (31–33), and limit viral escape (34, 35). Recently, we reported that widely different live vaccine vectors (Listeria monocytogenes, vaccinia virus) do not significantly alter attributes of the gB-8p–specific TCR repertoire in adult mice (22). In this study, we have leveraged these findings to elucidate how age and developmental changes alter the composition of the gB-8p–specific CD8+ TCR repertoire and report different types of “narrowing” at both ends of the life span (see Fig. 7 for illustration). The comparison between VACV-gB–infected neonatal and adult mice of the TCRβ repertoires involved in the CD8+ T cell responses to the gB-8p epitope demonstrates that the neonatal and adult gB-8p–specific TCRβ clonotypes have the same basic features. However, a larger proportion of shorter CDR3β sequences contributed to the gB-8p–specific TCRβ repertoires in neonatal mice compared with that in adult mice. We observed that very few of the TCRβ clonotypes of the most prevalent length of 14 aa in adult mice could be made without nucleotide additions, suggesting that these TCRβ clonotypes were not yet available in the immature naive TCRβ repertoires of the neonatal mice. Surprisingly, these differences in the extent of gene encoding of the CDR3β sequences and CDR3β length were not accompanied by substantial changes in either the Jβ gene usage bias or the prevalence of the CDR3β amino acid motif characteristic of gB-8p–specific TCRβ repertoires in adult mice. The observed trend for the proportion of TCR clonotypes featuring the WG motif to decrease with age is likely to largely be due to the reduction in clonotypic diversity in the aged mice rather than the involvement of greater numbers of non-motif-bearing clonotypes. That is, as the number of responding TCR clonotypes decreases, the few non-motif TCR clonotypes involved in many of the gB-specific repertoires contribute a larger proportion to the clonotype pool. Given the critical involvement of TdT in generating TCR diversity during ontogeny, some studies have examined CD8+ T cell responses in adult TdT−/− mice to understand better the fine specificity of the T cell repertoire that is available in early life. However, it is important to distinguish between the TCR repertoire features we observed in neonates and those previously described in TdT−/− mice, which provide a surrogate, but not a completely faithful mimic, of the murine neonatal repertoire at 1 wk of age. First, and contrary to what might be expected based on levels of TdT expression, we found that a substantial portion of the responding gB-8p–specific CD8+ T cells in neonatal mice contain random nucleotide additions, indicating that TdT has already made a significant contribution to the virus-specific repertoire by day 7. Second, whereas there is a high degree of sharing of the repertoire among individual TdT−/− mice (29), we see that the neonatal Ag-specific response shows little TCR sharing. This is best explained by the fact that neonatal mice have significantly fewer T cells in the periphery than that of adult TdT−/− mice, and therefore the chance of sharing of the dominant clonotypes among individuals when significantly fewer naive precursors are initially available must be relatively low. These important differences between neonatal and TdT−/− mice illustrate potential problems in the uncritical extrapolation between a knockout model and a physiological situation, which are neither quantitatively nor qualitatively identical. The difference between age groups in the extent of intermouse variation of the gB-8p–specific TCRβ repertoires appears to be related to the reduced diversity of TCRβ clonotypes and the associated increased clonal dominance of just a few clonotypes in the neonatal and aged mice. Namely, the overall gB-8p–specific TCRβ repertoire features in the neonatal and aged mice are largely determined by the one or two dominant TCRβ clonotypes in each mouse repertoire. In contrast, gB-8p–specific TCRβ repertoire features in adult mice are determined by many more different clonotypes, which have a more even clonal distribution. Despite the presence of strong intermouse variation in the overall features of the gB-8p–specific TCRβ repertoires in the entire study, the key difference between old and neonatal mice was great overlap in the TCRβ repertoires between individual 22-mo-old mice, owing to the emergence of a particular highly shared TCRβ clonotype (Vβ10 CASSYWGGQNTLYF Jβ2.4) in six of the eight mice that was substantially dominant in four of the 22-mo-old mice. Although this TCRβ clonotype was observed in younger mice, it was neither highly shared nor as clonally dominant as that in the 22-mo-old mice, suggesting that this clonotype may gain dominance when other higher-affinity clonotypes are no longer available in the naive repertoires of the older mice (see Fig. 7 for illustration). Importantly, the emergence of this highly shared clonotype suggests that the loss of TCR diversity (even among Ag-specific CD8+ T cells) with advancing age may not be entirely stochastic, but rather is biased toward TCR with particular clonotypic features. This bias toward shared clonotypes also indicates a narrowing of TCR diversity at the host population level, which potentially creates even higher likelihood of the “population wipeout” by microbial escape mutants in aged individuals. It is interesting to consider which fundamental properties allow certain clonotypes to be less susceptible to aging and to be more highly shared among aged individuals. Our results open the possibility that clonal selection of naive clonotypes in the periphery is governed by certain TCR structural properties and biased toward the most homeostatically fit competitors. Given that thymic involution and the subsequent reduction of thymic output begins early in life, the majority of naive T cells throughout the second half of the life span are generated and/or maintained by homeostatic mechanisms (36). This sets the stage for lifelong competition among related (intraclonal competition) and unrelated (interclonal competition) TCR clonotypes for space and key survival signals. Given that the most homeostatically fit clonotypes could have either a stronger affinity or greater promiscuity for self peptide–MHC complexes (37), it will be important to determine if these properties are indeed driving the selection of highly shared clonotypes in old mice. Another possible explanation for the involvement of particular clonotypes in old age may relate to the number of ways individual clonotypes are able to be created. This process, termed convergent recombination, enables some TCR sequences to be produced more frequently than others and has been shown to provide a reasonable explanation for the interindividual sharing of dominant clonotypes in public repertoires (38–40). Indeed, examination of the recombination mechanisms that could produce the highly shared clonotype observed in the 22-mo-old mice suggests that this clonotype has the potential to be efficiently produced by convergent recombination (Supplemental Fig. 2). It is possible that the clonotypes that are most efficiently created become overrepresented as thymic output decreases in old individuals. We currently are examining this possibility in more detail. Lastly, the increased dominance of shared clonotypes among aged individuals also raises the question of whether these clonotypes were originally derived from the naive or the memory CD8+ T cell compartment. In the naive repertoire, clonotypes exhibit a range of affinities toward peptide–MHC. During the course of infection, there appear to be affinity thresholds that regulate clonal selection and the extent to which a clonotype will proliferate (41, 42). Given that TCR signaling is dampened in naive T cells with age (43–45), it is possible that even higher-affinity TCRs are required in old mice to obtain sufficient levels of TCR signaling strength for both homeostatic maintenance and activation. If this is the case, then we might expect a higher-affinity cutoff in old mice, which would result in the emergence of fewer distinct clonotypes at the peak of the response. The more blunted TCR signaling observed in old mice, along with the fewer numbers of naive T cells, may also allow cross-reactive memory T cells to compete effectively and even dominate the response. Although this is difficult to prove experimentally, this scenario becomes more likely with age, as numbers of highly responsive memory T cells increase with accumulated exposure to environmental Ags. Although TCR diversity in aged mice was significantly lower than that observed in adult mice, we did not see these levels regress back to those found in neonates. Along these lines, we expected TCR diversity would continue to decrease with age, so that, for example, 26- or 30-mo-old mice would have even fewer total numbers of clonotypes than that of 18- or 22-mo-old mice. The 22-mo-old mice were initially included in our study to make sure that we were not stopping short of an age threshold in the loss of TCR diversity, described in some human studies (18, 46). The fact that TCR diversity was comparable in 18- and 22-mo-old mice may reflect that extensive variability that is often observed in aged individuals, or the fact that further reduction in diversity will occur with aging but was not fully evident even in 22-mo-old mice compared with 18-mo-old mice. Alternatively, there may be specific features of the gB-8p repertoire that allow TCR diversity to be better maintained in old age than what we might expect with other epitope-specific repertoires. Our group (data not shown) and others have estimated the naive precursor frequency of gB-8p CD8+ T cells at ∼400 cells/mouse (47), which is three to four times higher than the frequency of many other immunodominant epitope-specific T cells examined (48). It is possible that the sizeable precursor frequency and extensive TCR diversity (which are interconnected properties) enables the gB-8p repertoire to better withstand the deleterious effects of aging compared with many other epitope-specific repertoires. More studies with different epitope-specific repertoires are needed to identify the T cell repertoire characteristics (e.g., diversity, precursor frequency, clone size, clonotypic sharing, etc.) that afford preferential survival with advancing age. Our current study is an important first step in revealing how the clonotypic topography evolves across the life span (see Fig. 7 for illustration). Knowledge from these types of studies is paramount in providing us with the ability to choose the most durable protective epitopes for rational vaccine development in neonates and the elderly. We thank members of the Nikolich and Davenport laboratories for help and stimulating discussion, Paula Campbell at the University of Arizona Flow Cytometry Core Facility for expert sorting assistance, and the National Institutes of Health Tetramer Facility at Emory University for proficient tetramer production. This work was supported by National Institutes of Health Award AG20719 from the National Institute on Aging and was also supported in part by the Australian Research Council. V.V. is an Australian Research Council Future Fellow, and M.P.D. is a National Health and Medical Research Council Senior Research Fellow. HSV glycoprotein B 495–502 (HSV gB498–505; SSIEFARL).
. 2004. The role of mhc polymorphism in anti-microbial resistance. Microbes Infect. 6: 501–512.
. 2001. Most alpha/beta T cell receptor diversity is due to terminal deoxynucleotidyl transferase. J. Exp. Med. 194: 1385–1390. 1991. Junctional sequences of fetal T cell receptor beta chains have few N regions. J. Exp. Med. 174: 115–124.
. 1991. A special repertoire of alpha:beta T cells in neonatal mice. EMBO J. 10: 3647–3654.
. 1998. The role of the thymus and recent thymic migrants in the maintenance of the adult peripheral lymphocyte pool. J. Exp. Med. 187: 1839–1848.
. 1993. Lymphocyte lifespans: homeostasis, selection and competition. Immunol. Today 14: 25–29.
. 2002. Regulation of naïve and memory T-cell homeostasis. Microbes Infect. 4: 51–56.
. 1994. Clonal populations of T cells in normal elderly humans: the T cell equivalent to “benign monoclonal gammapathy.” J. Exp. Med. 179: 609–618.
. 1993. Unexpected expansions of CD8-bearing cells in old mice. J. Immunol. 151: 6657–6669.
. 1999. Differentiation of human CD8 T cells: implications for in vivo persistence of CD8+ CD28- cytotoxic effector clones. Int. Immunol. 11: 229–241.
. 2010. Diversity of the CD8+ T cell repertoire elicited against an immunodominant epitope does not depend on the context of infection. J. Immunol. 184: 2958–2965.
. 1995. 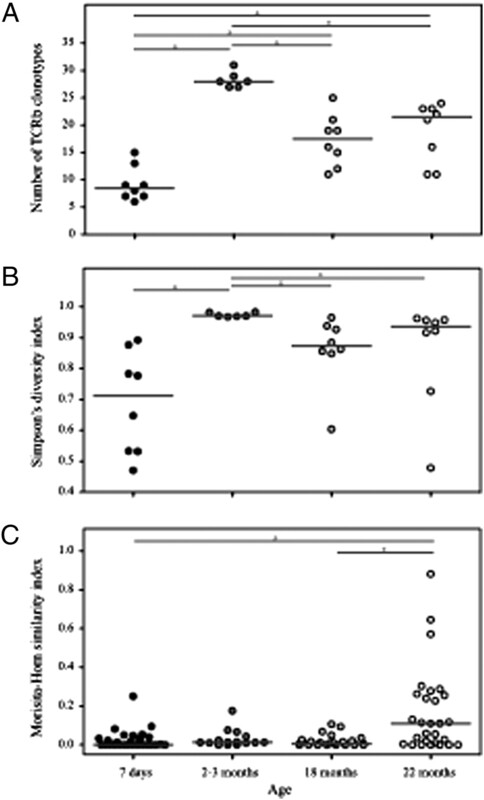 Characterization of diverse primary herpes simplex virus type 1 gB-specific cytotoxic T-cell response showing a preferential V beta bias. J. Virol. 69: 5849–5852.
. 2000. MHC polymorphism can enrich the T cell repertoire of the species by shifts in intrathymic selection. J. Immunol. 164: 1695–1698.
. 1988. The outline structure of the T-cell alpha beta receptor. EMBO J. 7: 3745–3755.
. 2008. Terminal deoxynucleotidyltransferase is required for the establishment of private virus-specific CD8+ TCR repertoires and facilitates optimal CTL responses. J. Immunol. 181: 2556–2562.
. 2001. Memory CD8+ T cells in heterologous antiviral immunity and immunopathology in the lung. Nat. Immunol. 2: 1067–1076.
. 1998. Protective heterologous antiviral immunity and enhanced immunopathogenesis mediated by memory T cell populations. J. Exp. Med. 188: 1705–1715.
. 2005. Heterologous T cell immunity in severe hepatitis C virus infection. J. Exp. Med. 201: 675–680.
. 2008. TCR beta-chain sharing in human CD8+ T cell responses to cytomegalovirus and EBV. J. Immunol. 181: 7853–7862. 1996. The aging immune system: primer and prospectus. Science 273: 70–74.
. 1973. Decline in phytohemagglutinin responsiveness of spleen cells from aging mice. Proc. Soc. Exp. Biol. Med. 144: 48–53.
. 1987. Decline in mitogen induced proliferation of lymphocytes with increasing age. Clin. Exp. Immunol. 70: 440–448.
. 2008. Endogenous naive CD8+ T cell precursor frequency regulates primary and memory responses to infection. Immunity 28: 859–869.